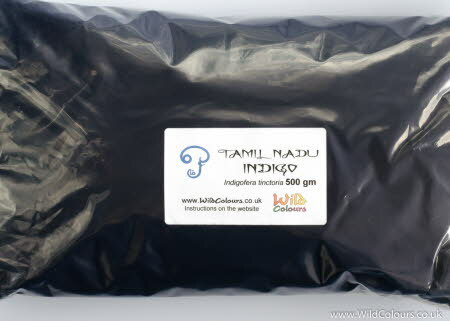 SAVE £20.25 over the 25 gram price of Tamil Nadu indigo dye. Buy natural indigo produced by one of India’s oldest manufacturers of indigo. Use Blue Gold, as this indigo is locally known in the country where the plant Indigofera tinctoria originally comes from. This is a high quality indigo with medium indigotin content (30%). The indigo dye powder is weighed and packed in a polythene grip-seal bag. The bag is then labelled and put in a second grip seal bag for extra protection. We then place the indigo dye in a padded envelope and post it to you First Class. To read more about Tamil Nadu Indigo - navigate to "Indigo" > "Tamil Indigo".